Could somebody please help me find out how old these soft paste porcelain Blue and White Tea Cups are? I have researched and researched and cannot find any marks that are the same as the marks on these blue and white tea cups. I am now beginning to think they may be quite rare, please help. The blue and white tea cups are very short but wide. Very delicate and hand painted. I believe they are hand painted soft paste porcelain. The makers mark on the bottom is like the large sail of a boat with the numbers 2346. I would be thankful for any help or information anyone can offer. 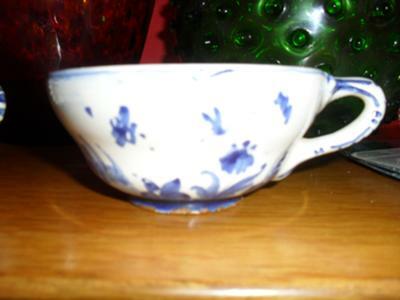 Kym, you would need to add a few more photos of your blue & white tea cups, before anyone could reliably identify them. Even the photo you have added is of very poor quality and provides insufficient detail to identify the pattern. Blue & White porcelain usually has underglaze decoration, which is done using a blue pigment called cobalt oxide. There are a lot of B&W porcelain pieces out there and it takes a keen eye for detail to recognise & identify the maker, before you can determine age and value. Add some more detailed photos and I’ll have a go.